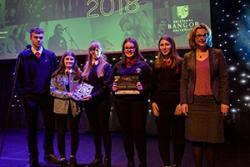 This year's Profi winners- left - right: Jordan Pritchard (Ysgol Tryfan), Heledd Roberts (Ysgol Tryfan), Miriam Harmens (Ysgol Tryfan), Stephanie Owen (Ysgol Dyffryn Ogwen), Ellie Owen (Ysgol Tryfan), and Lead Judge, Sasha Davies, Horizon Nuclear Power.Profi, an experiential learning and mentoring supporting year 12 pupils from secondary schools in Anglesey and Gwynedd has been shortlisted for an Arts & Business Cymru award. Profi boosts confidence and helps young people develop transferable employability skills and self-worth through a series of weekly workshops aimed to offer a number of different experiences to help widen horizons. The project has just completed its fifth successful year. As part of the project, local charities are invited to write briefs for the pupils containing issues in the community that need to be resolved. Working alongside Bangor University student volunteers, the pupils work as mixed teams to develop project ideas to tackle these issues, leading towards a grand final where they must demonstrate the skills and competencies they have gained throughout the project and pitch their ideas to a panel of judges hoping to win £500 for their charity to run their project. This year the winning team included pupils from Ysgol Tryfan and Ysgol Dyffryn Ogwen who worked on a brief presented by Crimebeat. This year Profi received the Culture step grant through the creative partnership held by Horizon Nuclear Power and Santander Universities, and through its hard work and success the Horizon Nuclear Power and Profi- Bangor University’s creative partnership, has been shortlisted for the Arts and Business and Community Award. The awards take place this Friday evening 25th May in Cardiff Bay’s Millennium Centre. Profi is supported financially by many local businesses and organisations namely Horizon Nuclear Power, Santander Universities, Jones Bros Civil Engineering UK, Cartrefi Cymunedol Gwynedd, Magnox Ltd, Arts & Business Culture step Grant, North Wales Economic Ambition Board, North & Mid Wales Reaching Wider Partnership. Profi also receives support from NatWest, Bangor Students Union and has partnerships with the Princes Trust, Careers Wales and many local charities namely Crimebeat, Mentrau Iaith Cymru, Gisda and Mind Cymru.